Since I still have one week of vacation before returning to Paris, I'm trying not to think too much about what I'm going to do when I get home. 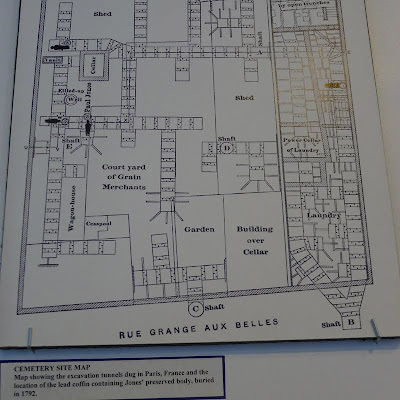 Eating a croissant and strolling along the Seine are on my list, but perhaps more importantly I want to visit 42 rue de Tournon*, which is where John Paul Jones, the "Father of the American Navy," died on July 18, 1792. Originally from Scotland, Jones became the captain of the first American frigate to hoist the "Stars and Stripes" and received a nine gun salute from the French Vice-Admiral La Motte Piquet marking the first official foreign recognition of the American flag. Jones' success while fighting the British and his famous declaration, "I may sink, but I'll be damned if I strike [surrender]", during the naval battle between the HMS Serapis and the Bonhomme Richard prompted King Louis XVI to honor him with the title of "Chevalier", or knight. After an unsuccessful period serving Empress Catherine the Great of Russia, Jones retired to Paris, where he lived in virtual seclusion before succumbing to the complications of a long illness at the age of 45. Jones, who was buried in a lead coffin in St. Louis Cemetery, was forgotten until 1899 when Horace Porter, the American Ambassador to France, began searching for his burial plot. A faulty copy of Jones' burial certificate led Porter on a wild goose chase, so it wasn't until six years later that he located the royal cemetery, which had been sold by France's revolutionary government. By the time that Porter finally found the former cemetery, the property had been used as a vegetable garden, a dumping ground for the bodies of dead animals, an apartment house, a laundry, a grocery store, and cesspools, meaning that Porter's workers had to sift through decades worth of waste to discover Jones' lead coffin. Cemetery site map showing the excavation tunnels and location of the lead coffin. 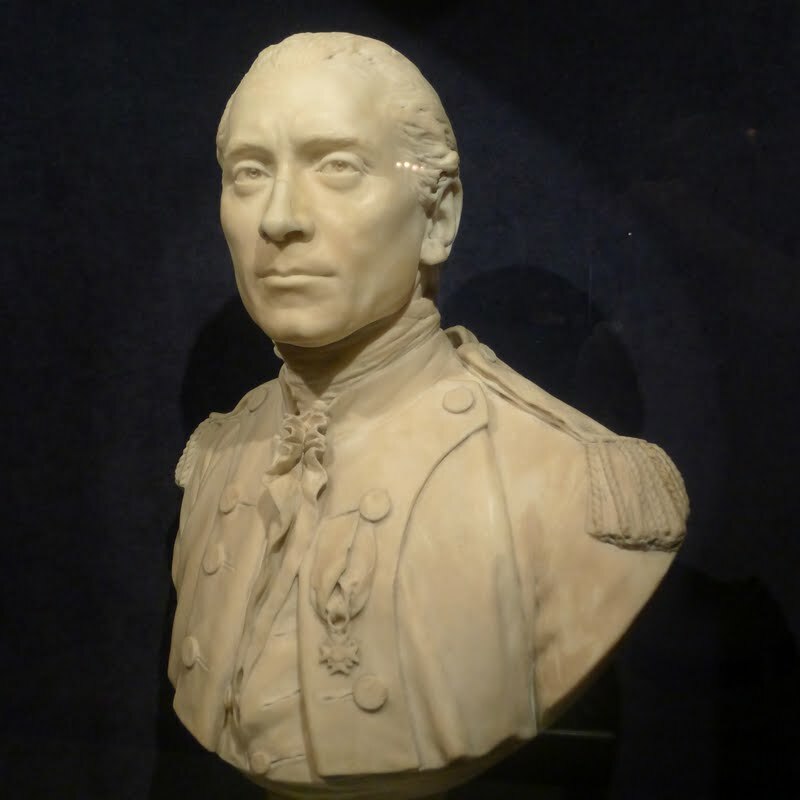 Once Jones' body was recovered and positively identified using the bust of Jones made by Jean-Antoine Houdon, the lead coffin bearing his remains was escorted with full military honors along the Champs Elysees and was transported across the Atlantic by a fleet of naval vessels. A commemorative exercise with an address by President Theodore Roosevelt was held at the United States Naval Academy in Annapolis, Maryland, which is where Jones' lead coffin was placed in an ornate sarcophagus of black and white Great Pyrenees marble from France. earliest traditions of heroism and victory. Erected by the Congress A.D. 1912. 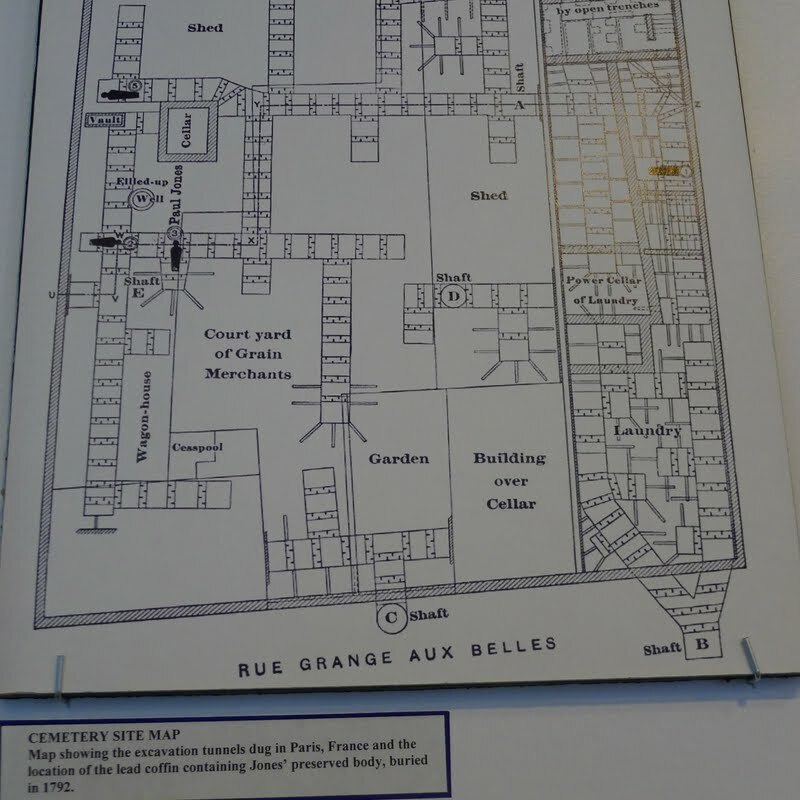 *John Paul Jones lived at 42 rue de Tournon, which is currently 19 rue de Tournon. I've seen his exhumation photos. It's amazing how well preserved he is. Somebody long ago went through a lot of trouble to take good care of his remains. Wow, I missed this entry many years ago, maybe it was before I knew your blog. So very intersting.